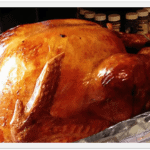 I have been brining my holiday turkey for the past 5 or 6 years now and we absolutely love it. I wouldn’t make it any other way. We also buy fresh turkey from the local farmer, which is an absolute treat. The brine recipe is at the end of the post, an adaptation of Alton Brown’s recipe. And in the last couple of years I’ve ditched the oven and started making my turkey in a roaster. What a difference! So much faster and absolutely juicy and delicious! Each year the turkeys are “sent away” on the Tuesday morning before Thanksgiving. 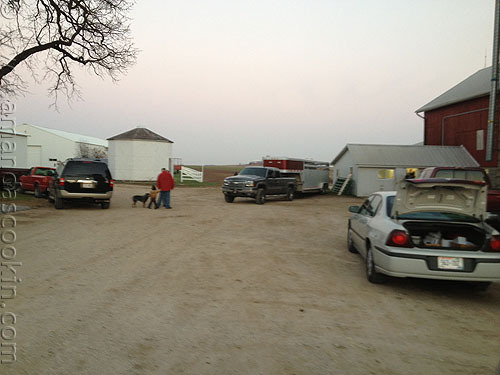 On Tuesday afternoon, a line forms at Butch’s milk house, just outside the dairy barn for first pickings. He has a list. If your name isn’t on it by the previous July, you are probably out a turkey. Most of us have a permanent spot on the list, but I always make sure I’m on it nonetheless! When it’s your turn you tell him what size you are looking for. 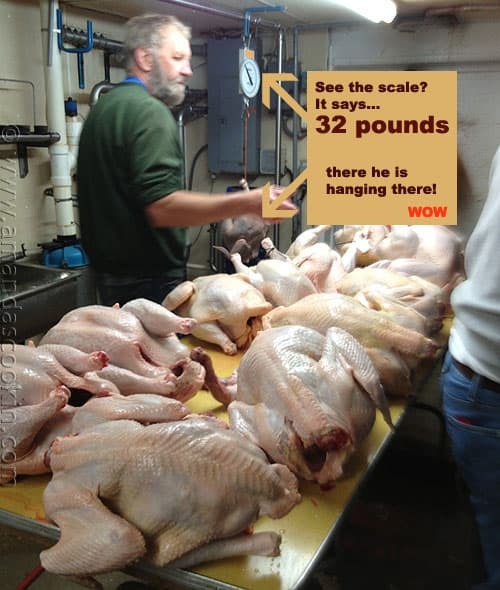 The largest turkey I ever bought from him was a 28-pounder that I took to Iowa with me a few years ago. Even though I cook Thanksgiving dinner every year for me, hubby and the kids, this year I actually had seven additional guests. So I asked for a big one. And a big one I got! 32 pounds. Thirty. Two. After paying for my bird I got back into the car and headed out the driveway. My youngest son was with me and we were headed to parent-teacher conferences. No time to stop and enjoy this beautiful sunset as we left. 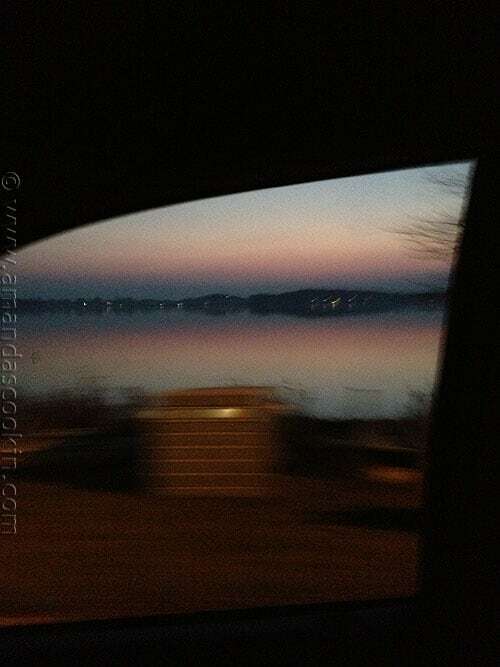 Nor was there time to stop and take some beautiful sunset over the lake photos, the best I could get was this out the car window on my cell phone as we passed by on the way to the school. That got me thinking. We just overwhelm ourselves don’t we? We cram so much into our days that there’s barely any time to breathe. I would have loved to have stopped and snapped some photos on the lake, the view was spectacular, but I just couldn’t. 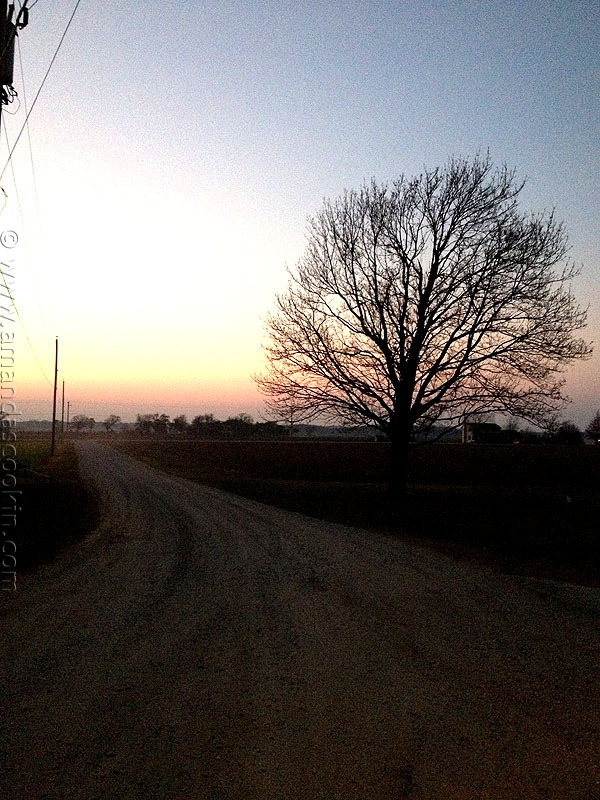 I squeezed everything in on such a tight schedule, that there was no time to stop and enjoy the little things. Well of course parent-teacher conferences came and went and before long we were on our way home and it was time to get the turkey into the brine. I had prepared it earlier that day and it was waiting patiently in the refrigerator for me. So into the brine and the cooler he went, covered with ice and resting for the night. That left me with my thoughts. I stood there in the kitchen looking at the clean counters and that hard working oven. I knew good and well I’d be giving it a major workout in the next couple of days! Oh incidentally, that’s the Frigidaire Gallery Range with Symmetry Double Ovens. I got it a little over a year ago, do you remember that? It’s funny, I read that it’s two large ovens are each big enough to cook a 28-pound turkey. Well I’m here to tell you that I cooked that 32-pound bird in the bottom oven in six hours and it was absolutely perfect! So anyway, back to my thoughts. As I stood there in the kitchen going over the next two days in my head, I knew I didn’t want to spend the entire time in the kitchen. 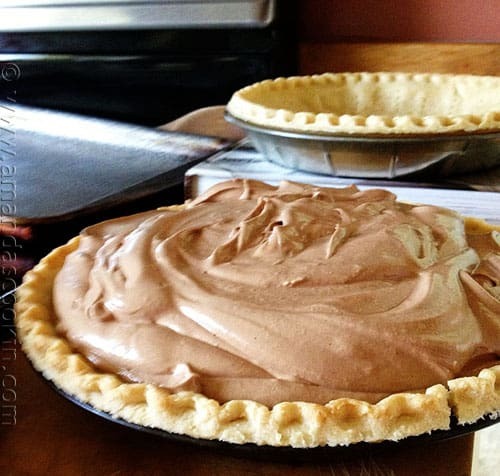 The plan was to make as much as possible ahead of time, like this French Silk Pie and a Perfect Pumpkin Pie. The day before the big meal I chopped vegetables, made pies, cranberry relish and peeled potatoes. 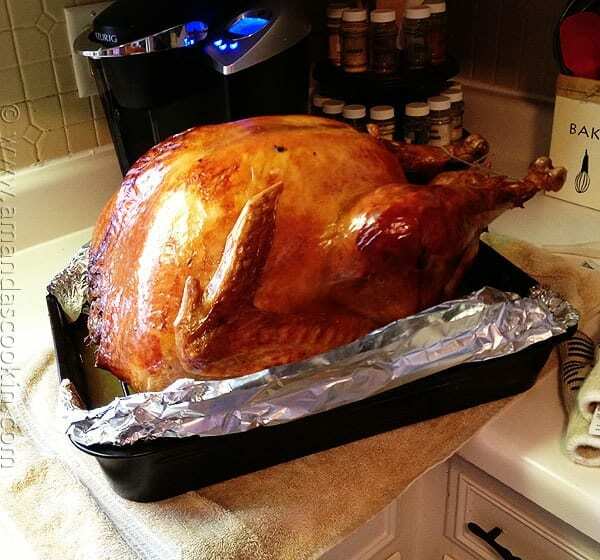 On the big day I loaded that huge bird into the bottom oven and was able to enjoy some coffee and watch the news. I wasn’t worried because I knew I had another full sized oven to bake sweet potatoes, stuffing and Homemade Pull Apart Rolls in. No rushing to bake things at the last minute as in the past. No worrying about alternating baking dishes and covering everything with foil. Having this double oven has been a true blessing! 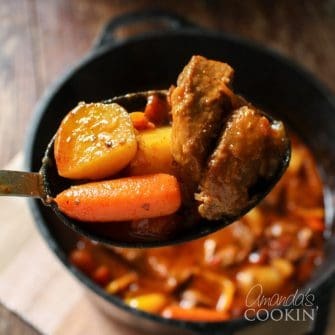 I found these great ideas for using leftover turkey, which I’m sure we’ll have plenty of! Frigidaire gave me the ultimate gift… the gift of time. For almost 90 years their legendary innovations have helped bring efficiency to the home – from the first electric household refrigerator in 1918, to today’s appliances, just like my Gallery Range with Symmetry Double Ovens. I consider myself lucky. I already have one of these amazing appliances, and I hope one of you lucky folks will get one too! This scene is my favorite. Dinner on the buffet table and everyone loading up their plates. 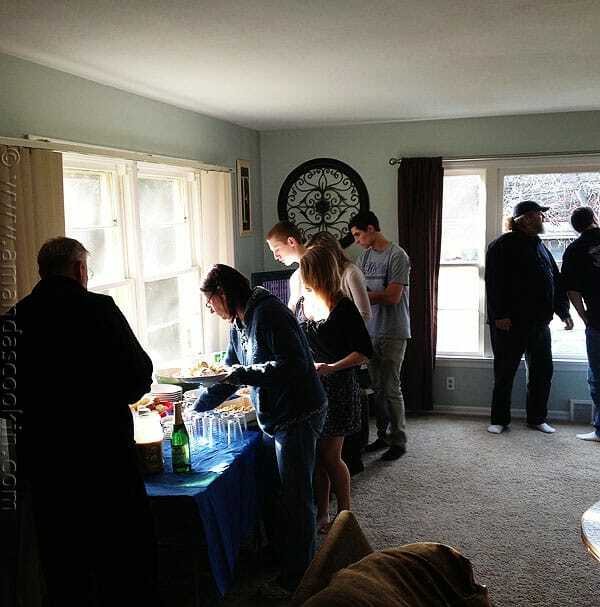 I had the most guests I’ve ever had and the least amount of turkey day stress ever. It was a wonderful Thanksgiving and I look forward to many more! This recipe is enough brine for a 14-16 pound turkey. I simply doubled it for my 32 pounder. The night before combine the brine, water and ice in a 5-gallon bucket or large heavy duty bag. Place the thawed turkey (innards removed) breast side down into the brine. If necessary, weigh down the bird to ensure it is fully immersed, cover, and refrigerate or set in cool area for 8 to 16 hours, turning the bird once half way through brining. Stuff. Tuck the wings underneath the bird and coat the skin liberally with canola oil. Roast the turkey on lowest level of the oven at 500 degrees F for 30 minutes. Reduce the oven temperature to 350 degrees F. A 14 to 16 pound bird should require a total of 2 to 2 1/2 hours of roasting. Let the turkey rest, loosely covered with foil or a large mixing bowl for 15 minutes before carving. My 32 pound turkey took 6 hours at 325. I chose 325 F because I knew with the turkey being as large as it was that I may have issues with fat dripping on the bottom of the oven. Because of that I lined the bottom of the oven with foil and changed that foil twice during cooking, every two hours. NOTE about brining a big bird. Instead of a bucket I used a heavy duty bag inside of a cooler. You know, the cooler you fill with food, pop and maybe beer all summer long. I place the bagged bird into the cooler then pour the brine into bag. Secure the bag really well with several rubber bands nice and tight. Cover bagged bird with ice and close the cooler. Check every 5 or 6 hours and drain the cooler if needed and replace the melted ice. Keep the turkey nice and cold until you are ready to rinse it and put it in the oven. This post is sponsored by Frigidaire. I received monetary compensation for my participation, but my review and opinions are my own. I have ALWAYS wanted to brine a turkey! Your tip about the cooler and big bag have sealed the deal for me. Now I know I can do this, too! Thanks for the tip. I’ll have to wait until later as we are having Christmas out of town. But that won’t stop me from doing it for Easter – if not before, just because. Beautiful 32 POUND turkey! Wow! Wow! Sounds like you had a wonderful Thanksgiving! 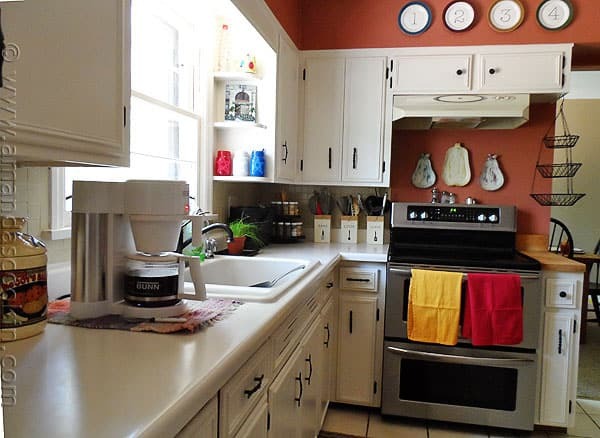 I really like the idea of having two ovens!